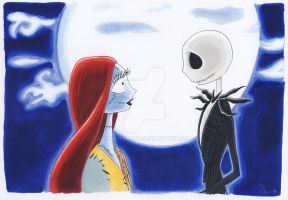 Eighteenth pic: Jack and Sally. He came out shorter than he should be, and her dress is different... I'm sorry... but I actually liked it. The song is, of course "Simply meant to be" [link] ... I'm not sure if that's the name, but, I syill love it. Jack's face here... doesn't really sit well with me. It's the smile. It looks too... stupid, for me. Se van a la par... qué mejor que un esqueleto en traje con una muñeca rota. waaaaaaahhhhhhh Siempre me a encantad Night before christmas!!! me encanta~!! !